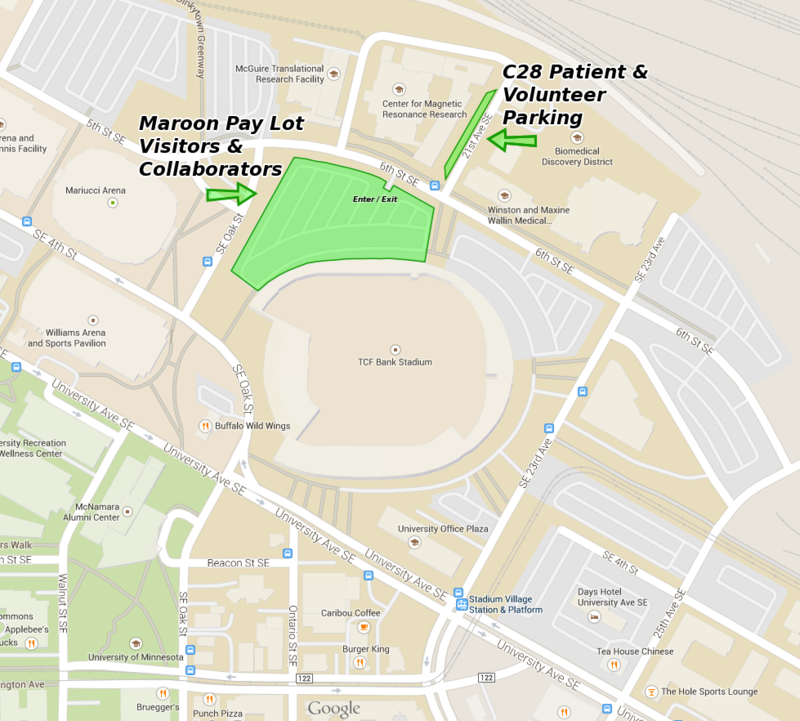 U of M:CMRR:Contacts and Directions. Please contact Deb Morgan for more information about the CMRR or NIBIB/NCRR Collaboration and Service Support. Please contact volunteer@cmrr.umn.edu for more information about participating in studies as a volunteer. The CMRR is on the University of Minneapolis campus, East Bank. Please allow a few minutes of extra time when planning your drive due to construction around campus. Take the Huron Boulevard exit. Proceed approximately 3 blocks down Huron Boulevard to Washington Avenue. Continue straight across Washington Avenue. Continue straight across University Avenue onto SE 23rd Avenue. Proceed approximately 3 blocks to SE 6th Street (first left past the TCF Bank stadium). The CMRR is on the right (2021). Please see parking instructions and map below. Take I-35W south towards Minneapolis. Take the University Avenue exit and proceed east-bound. Take the second left onto University Avenue. Drive approximately 12 blocks east on University Avenue to SE 23rd Avenue. Turn left on SE 23rd Avenue. Take I-35W north towards Minneapolis. Take the I-94 East exit. Proceed approximately 2 mi to the Huron Boulevard exit on the right. Proceed approximately 3 blocks down Huron Boulevard to Washington Aveune. Turn left on SE 6th Street. On street parking is available along the sidewalk to the East side of the CMRR building in the spots marked "Contract Parking C28". Please ask the front desk staff or your investigator for a parking pass which needs to be displayed on your dash during your visit.